Also serving communities of Downingtown, Malvern, Paoli, Coatesville, Pottstown. There are 20 Memory Care Facilities in the Exton area, with 2 in Exton and 18 nearby. The average cost of memory care in Exton is $3,653 per month. This is lower than the national median of $4,650. To help you with your search, browse the 10 reviews below for memory care facilities in Exton. Better rated regions include Wilmington with an average rating of 4.7 out of 5 stars. Caring.com has helped thousands of families find high-quality senior care. To speak with one of our Family Advisors about memory care options and costs in Exton, call (855) 863-8283. Located within Chester County near Philadelphia, Exton, Pennsylvania, is grouped within the West Whitehall Township census data, which shows a population of about 18,385, of whom 12.1 percent are seniors aged 65 or older. Some of these seniors have Alzheimer's and other forms of dementia and are part of the estimated 280,000 people in Pennsylvania diagnosed with Alzheimer's and related cognitive conditions. Exton has two memory care facilities with 17 more in nearby neighborhoods like Downington, West Chester and Malvern. 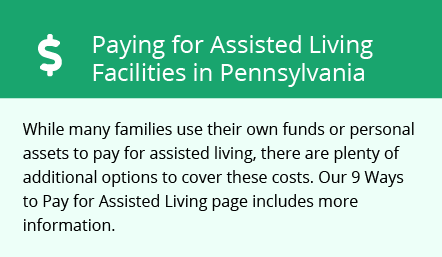 These facilities, called special care units or SCUs in Pennsylvania, are generally co-located with assisted living residences or personal care homes. The cost of living is about 140 in Exton, which is much higher than the national average of 100. Also, healthcare is 15 percent higher than the national average and 8 percent higher than the state average, which might be something to consider for families with loved ones in memory care here. Exton has a violent crime rate of 35.6, somewhat higher than the U.S. average of 31.1, and a property crime rate of 47.1, significantly higher than the U.S. average of 38.1. Despite the higher crime stats, residents in memory care facilities should be safe. Additional security measures such as cameras, alarms and other devices are standard in these facilities. Exton's weather includes 200 sunny days a year, despite receiving 47 inches of rain and 28 inches of snow each year. The city enjoys four distinct seasons, with July highs average 84 degrees and the January lows average 21 degrees, making certain times of year a challenge for seniors sensitive to the heat or cold. Exton, along with the rest of Pennsylvania, is tax-friendly toward retirees, with no tax on Social Security income or withdrawals from retirement accounts. Senior income and public or private pension income is also tax-exempt, which may leave room in the budget to help pay for incidentals while living in a facility. Memory Care costs in Exton start around $3,653 per month on average, while the nationwide average cost of memory care is $4,800 per month. It’s important to note that memory care rates in Exton and the surrounding suburbs can vary widely based on factors such as location, the level of care needed, apartment size and the types of amenities offered at each community. Exton and the surrounding area are home to numerous government agencies and non-profit organizations offering help for seniors searching for or currently residing in an assisted living community. These organizations can also provide assistance in a number of other eldercare services such as geriatric care management, elder law advice, estate planning, finding home care and health and wellness programs. To see a list of free memory care resources in Exton, please visit our Assisted Living in Pennsylvania page. Exton-area assisted living communities must adhere to the comprehensive set of state laws and regulations that all assisted living communities in Pennsylvania are required to follow. Visit our Memory Care in Pennsylvania page for more information about these laws.